For various companies, I have had to endure those tests for personality type or right brain/left brain analysis, so that whichever supervisor at the time could try to figure out how to get more work out of me or whatever (or perhaps why I was so dang amazing). And basically, I have always, whether on a sliding scale or a grid, tested out on the brain thing almost dead-center. One time slightly more in to the right and others just over the left line. But here is the deal. 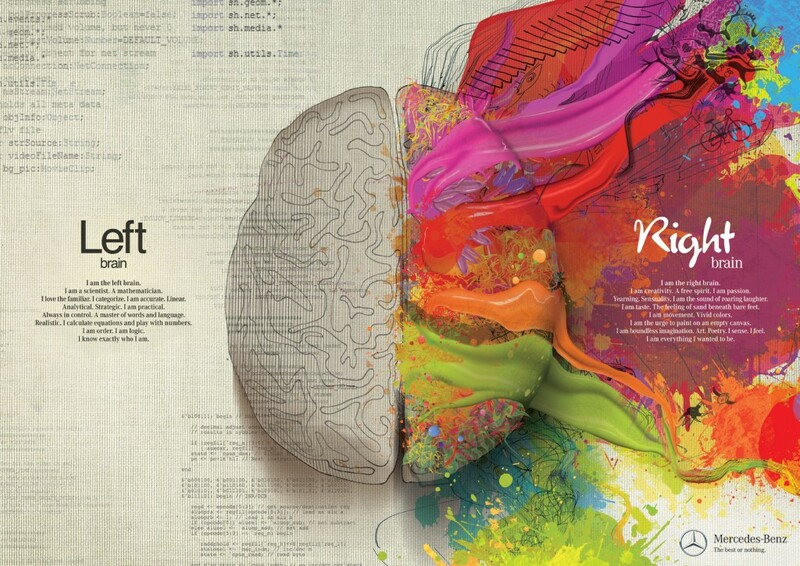 I think truly, I am supposed to be right-brained. And that I am actually right-brained, but that some invisible lid has been placed to squelch it. In fact, I can remember being a little ashamed when the numbers went more right – like I was going to let down the company because of it or something. I love zeal and passion and creativity and creative people’s gifts and abilities amaze me. When I hear an amazing lyric to just the most intoxicating melody, or read a poem which strings words together I’d never thought of, or experience a painting with colors that actually make me salivate – first, I go utterly speechless. Just…nothing. Then I start trying to explain it in thousands of words…but can’t really. And I wish to create like that too. I want to be a poet and a painter, a singer and a writer. I am happiest during inspiration, those times heaven just passes through you and you get all things divine and can suddenly reveal them through whatever your art. But creativity is only rewarded on Etsy and Pinterest. I am mostly kidding about that. But you know what I mean. In job interviews, they never ask you what you last created – which would be so insightful, wouldn’t it? And I think I have unwittingly, at times, succumbed to the right-brain-bashing so prevalent in our logic and reason culture. I actually had a pastor call me forward in church once to speak a “Word of Knowledge”* over me, during which he spent 15 minutes insulting me (and my husband and our two greatest-ever friends) for being creative, saying things like “right-brained people are just ‘differn’t,’ they’re just differn’t.” And believe me when I tell you he didn’t mean that in a o-she-is-such-a-unique-creation-of-God kind of way. I crept back to my seat in shame for being openly creative, passionate and colorful, for daring to live as a multi-faceted, colors-of-the-rainbow, life-filled, green-leafed, curious, and zesty reflection of the Creator. And the lid is tightened. Dance like David; Preach like Paul. There was a contemporary Christian song out in the 70s that I cannot find and I can’t remember the artist or even all the words, but what I do remember of the lyric is this, I wanna dance like David, preach like Paul…. New-Testament-Paul and Old-Testament-David are two of my heroes in the faith. Both strong men, Paul was as good at arguing a case for even the logic in the mysteries of the faith, and quite pragmatic in his understanding the workings of the Holy Spirit – as David was in penning words that that he must surely have heard in heavenly realms. We still sing his passionate prose today, pattern our music after that which so pleased the Lord. One might be able to make a case for Paul being left-brained, and David, right. For Paul being able to make a point by point, logical dissertation on the law and its’ fulfillment through Christ, and for David being able to lead a whole nation in raucous dance and worship before the Lord. In undies. So, they say left brained people are more logical, analytical and objective. 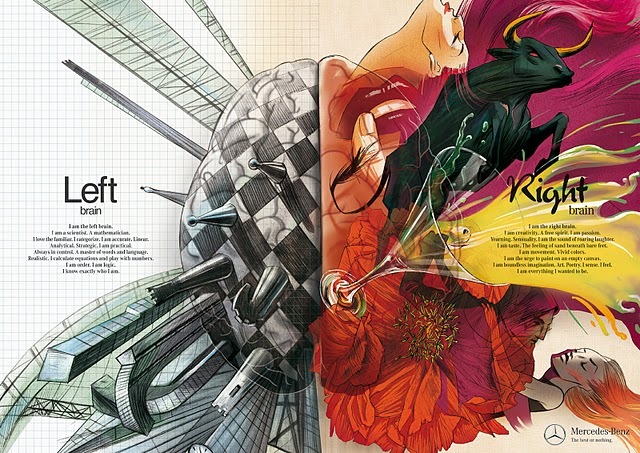 And they say that right-brained people are more intuitive, thoughtful and subjective. And I just think we live in a culture that rewards one and dismisses the other too quickly. Think school budgets: what gets cut first? 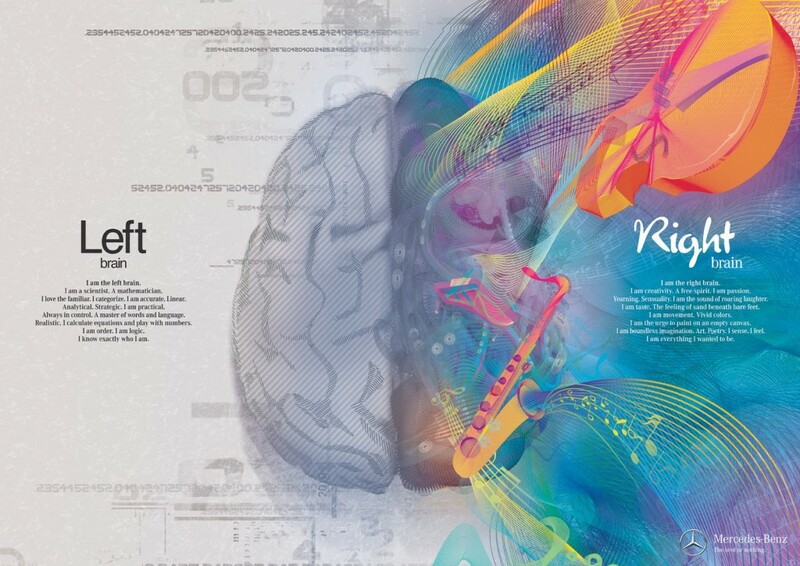 This Mercedes-Benz (passion) ad says: “I am the right brain. I am creativity. A free spirit. I am passion. Yearning. Sensuality. I am the sound of roaring laughter. I am taste. The feeling of sand beneath bare feet. I am movement. Vivid colors. I am the urge to paint on an empty canvas. I am boundless imagination. Art. Poetry. I sense. I feel. I am everything I wanted to be.” And I might add: everything God created me to be + a wild-ox as spoken of in Psalm 92. Maybe I am just writing a declaration for myself, but I want to create like the Creator. Can you imagine 6 whole days to create anything you want and then a 7th just to enjoy it all? I want to re-learn to value what I instinctively valued as a carefree little girl (soooooooooooo many years ago), that pen-to-paper and color and glue and mess and trying-something-even-if-it-turns-out-disastrously just in case in the process there is that one moment of glory is not only acceptable, but strongly desired! I want to add wild fits of invention and color into the ordered, mundane moments of my day. And I would like for my left-brain, logical sensibilities to quit hampering my right-brain intuition and wide-open thoughts, which are the beautiful meadow-lands of my dreams. Why the heck must logic and objectivity be at war with dreams? No right-brain bashing. Not even by my own left-brain. *Word of Knowledge: This is a spiritual gift listed in 1 Corinthians 12. It is a divine revelation of knowledge given by the Holy Spirit. Sometimes these “words” are factual in nature. An intercessor may impart things God has revealed to them about the person being prayed for, sometimes there is a calling out, like when Jesus told the Samaritan woman she’d been married 5 times and the new guy wasn’t even her husband. In my writing above, I put “Word of Knowledge” in quotations because in retrospect, and with grace for this particular pastor, he was not sharing any supernatural revelation nor the heart of God at all, but rather his opinion that creative people are weird. It was delivered as a Word of Knowledge, but was a sad misuse of spiritual authority, I believe. And that is a huge topic for another day. So interesting (and those ads are pretty nifty!) I remember being in school and taking these tests and it’s opposite of what you mention here…right-brain was the “right” brain. I always felt like the rule-following, orderly dork that scored off the charts on the left side. :) Now, I’ve come to know that left is best, yes indeed. :) (Just kidding!) Love you and your well-rounded brain! I’m with Stef. Off the charts left-brained. Though balancing a bit as I get older, I think. I did one of those, very lengthy, very involved tests in a leadership class at a prior employer and I was the most left-brained person in the class. My husband? The most right-brained person on the planet, I’m pretty sure. Which makes for a very interesting marriage, let me tell you. Particularly because we’re both very similar personality types. Similar personalities who approach everything completely differently. Hmm… conflict much? :) Anyway… isn’t it just those differences that make the world go ’round? I love the balance you have between the two. Uniquely gifted to use all of what God gave you AND bring the two sides of the brain together in the people you know. Hahahhahha! You guys should be TEACHING marriage – it would be hilarious for the rest of us!! This ones easy. Just print out your excel spreadsheet and let Sean blow it up with a grenade! Structure with creativity! Working together. :) — Dave rh. Very good essay! That is why I encourage Katie, who is 7, to do what she loves; create, draw, make up stories, etc. She is the middle of Valerie’s 3 younger children and sometimes gets lost in the shuffle. Keep creating and sharing with us.